Hot Tips are the replacement spouts and overcaps for our 1,2, and 4oz bottles of Hot Stuff Original thin CA glue, Super T medium gap-filling CA glue, and Special T thick ultra gap-filling CA glue. If you are having problems with spouts clogging, you may first want to read up on why spouts clog and how to prevent it in our Frequently Asked Questions about CA glue from Satellite City Instant Glues. However, sometimes you can't control the situation that is causing your spouts to clog. 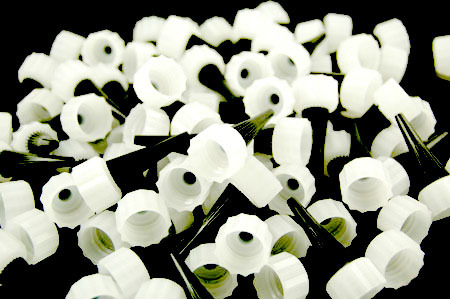 If that's the case, we offer replacement spouts and overcaps.